Reading comprehension is built upon other skills. 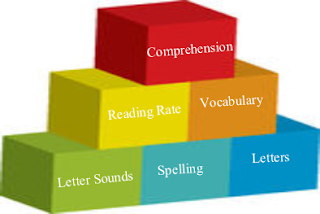 Students with difficulties in one or more of the foundation blocks, will likely also experience difficulty with reading comprehension. The bottom row of block are closely linked to each other. And of course is there is a delay at this level, there will be a delay at the other levels. As these skills are mastered, fluency or ones reading rate is important as well. If a student is spending their energies laboring of sounding out many of the words they reading in a paragraph, this makes it more difficult to remember what they read. Vocabulary is essential for understanding the content of what is read. It has been interesting to watch students over the years as they complete their educational assessments. Students with excellent vocabulary but poor word identification skills will often do well on reading comprehension questions. They are using their vocabulary skills to make up for the words they cannot read. While they may score well, they are still working harder than most. Their dyslexia may go overlooked longer than usual since they are able to compensate for their poor word identification skills. When you are reading with your child and their are laboring over many words in order to read the passage, you can be confident that their comprehension will be affected. Apply your skills of deduction to see if you can determine which block is missing on the foundation. Often, the breakdown happens as the words become longer and have more syllables. If your child is still struggling of identifying letter sounds, it is important to back up and spend time on letter sounds until they are fluent. Once letter sounds are strong, then it is time to start working on learning about syllable types and rules. This will help improve reading and spelling. Your detective skills are important here as well. Take notice of what part of the word your student is struggling to decode. Sometimes, kids can read a word once the suffix is covered up. Once you notice something like that, it tells you one of the skills you need to address.